Routine maintenance and repair work often involves bonding of pieces that have come apart. When the bonding involves metal surfaces that may later need to be machined or drilled, it is important to select an adhesive that will provide a secure bond comparable to a weld. 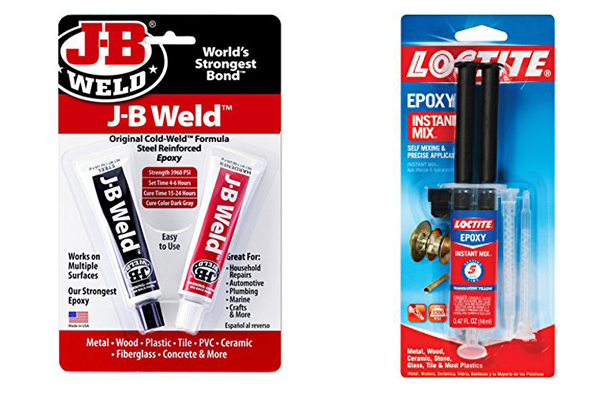 A comparison of JB Weld vs Loctite Epoxy can bring you closer to making an informed choice. Both JB Weld and Loctite Epoxy have products suitable for creating adhesive welds in metal surfaces. JB Weld requires 4-6 hours initial set time, and cures over 15 hours to provide a strong bond that can withstand further machining. Loctite Epoxy provides a quicker setting solution, with the adhesive setting in 4 to 6 minutes. Thus, for quick projects, Loctite Epoxy is likely to be a better fit for the job. However, in terms of bond strength, JB weld comes out tops with a bond strength of up to 3960 pounds per square inch (psi) compared to Loctite Epoxy’s 3000 psi. Both JB Weld and Loctite Epoxy are applicable to a wide variety of metals, with JB Weld extending to concrete, fiberglass and brick. For marine applications, JB Weld performs exceptionally well. However, for Loctite Epoxy, marine applications require a specialized marine epoxy rather than its weld version. Another key variation is in the temperature conditions that the epoxies can withstand. JB Weld allows you to use the finished surfaces in conditions up to 550 degrees F, while Loctite Epoxy weld is limited to an upper temperature of 350 degrees F.
Overall, for heavy duty applications, JB Weld is the clear winner, giving you a much stronger bond that can operate in harsher conditions than bonds formed with Loctite Epoxy Weld. However, for projects that require fast setting, Loctite Epoxy wins the JB weld vs Loctite Epoxy bout, allowing you to have a bond in the shortest time possible.